The Raiders tried to keep it close in the first half but the Royals, led by 21 points from Paige Bueckers, cruised to a 61-34 victory. Hopkins guard Paige Bueckers was loose. The Royals’ Class 4A semifinal game against Roseville was moments from beginning, but there was no sign of nerves. Bueckers was laughing as she directed a teammate to the right spot before pregame introductions. That’s the way it is for a program for which big games are simply a way of life. 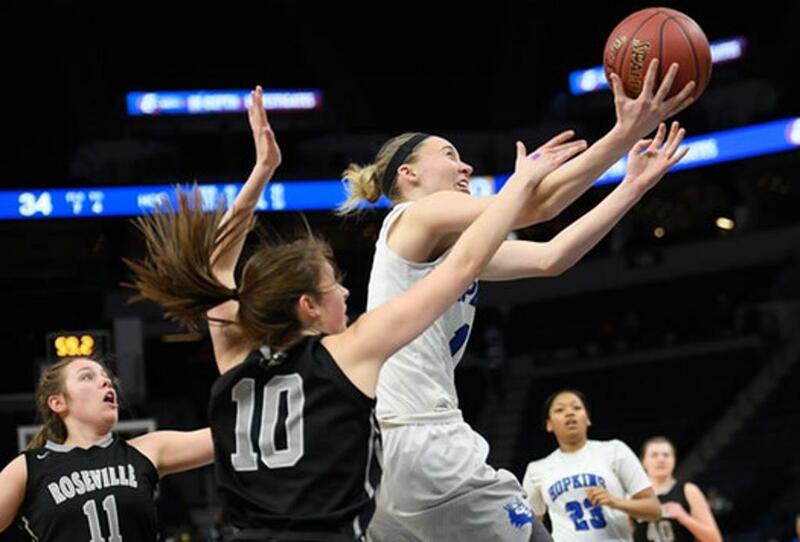 Hopkins did just as expected, rolling over Roseville 61-34 on Thursday to advance to the Class 4A championship game for the third consecutive season. Bueckers, the Star Tribune Metro Player of the Year, led the Royals with 21 points. Roseville certainly didn’t roll over. The Raiders never backed down from Hopkins and trailed by just eight points, 23-15, with less than six minutes left in the first half. Hopkins then asserted itself on the offensive boards, getting three putbacks – two by eighth-grader Amaya Battle – to build a 21-point halftime lead. The Royals’ pressure defense and transition offense extended their lead early in the second half to 29 points, a comfortable margin they maintained throughout the rest of the game. Battle finished 13 points along with her eight rebounds and Dlayla Chakolis added 12 points for Hopkins (28-3). The Royals’ dominance showed in the game box score. They outshot the Raiders from the floor, owned a 41-29 rebounding edge and forced 17 turnovers while committing just six. Jayda Johnston had 9 points and Josie Haug added 7 for Roseville (23-8). Hopkins guard Paige Bueckers was loose. The Royals' Class 4A semifinal game against Roseville was moments from beginning, but there was no sign of nerves. Bueckers was laughing as she directed a teammate to the right spot before pregame introductions. Hopkins did just as expected, rolling over Roseville 61-34 to advance to the Class 4A championship game for the third consecutive season. Bueckers, the Star Tribune Metro Player of the Year, led the Royals with 21 points. Hopkins asserted itself thereafter, building a 21-point lead at halftime. The Royals' pressure defense and transition offense extended the lead early in the second half to 29 points, a comfortable margin they maintained throughout the rest of the game. 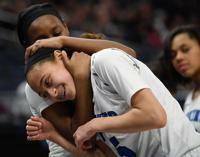 Dlayla Chakolis added 12 points and Amaya Battle had 11 points and eight rebounds for Hopkins (28-3). The Royals' dominance showed in the game boxscore. They outshot the Raiders from the floor, owned a 39-29 rebounding edge and forced 16 turnovers while committing just six. What Hopkins makes look easy is actually the result of hours spent in the gym, endless film study by coach Brian Cosgriff and his staff, and a tradition in which players from past teams routinely return to Hopkins to work with the Royals. Former players like Leslie Knight and T.T. Starks, stalwarts for past Hopkins championship teams, come back to the school often.